One night in Granada, inspired by our visit to the beautiful Alhambra earlier that day, Bryan, Colin and I put together a March Madness-style bracket to determine the best place ever. I know, it’s a heady idea. We jumped right in, seeding what we thought were the sweet 16 of best places, and I have to say that it’s possible we left out some worthy competitors in our haste. The contest was definitely skewed toward places one of the three of us had visited, which explains how top-seeded Taj Mahal went down against admittedly under-seeded Venice (yes, the whole city) (no, we were not overly careful with our seeding). We can also admit to some serious home-court advantage taking the Alhambra as far as it went. The toughest match was between the Great Wall (you can see it from space) and the Forbidden City (the details, the opulence). China–you’ve gotta visit. We agreed that we could have easily expanded this to 32 places (Stonehenge, Notre Dame, Parthenon, Aix-en-Provence…), and that if we had, the outcome likely would be different. 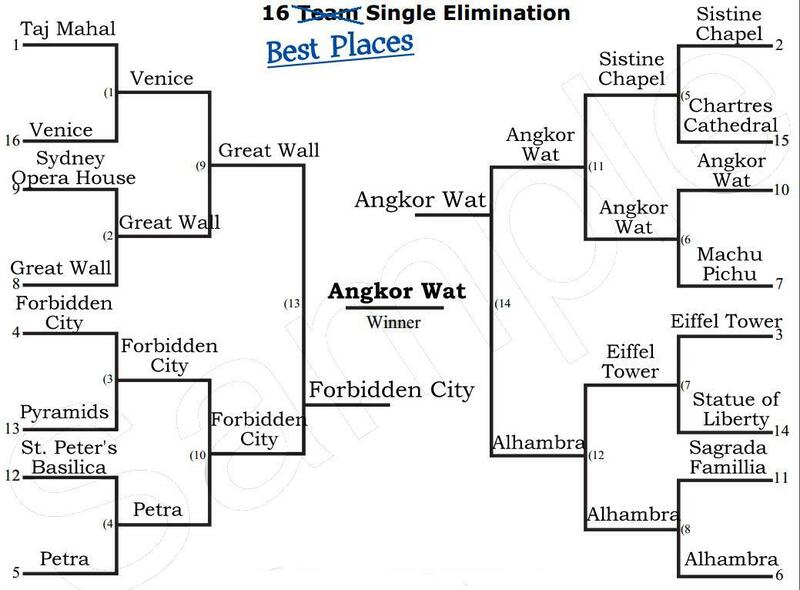 Tenth-seeded Angkor Wat taking the show was a surprise to all three of us. Think we’re dead wrong? Did we miss something fabulous? What would you add to our bracket? 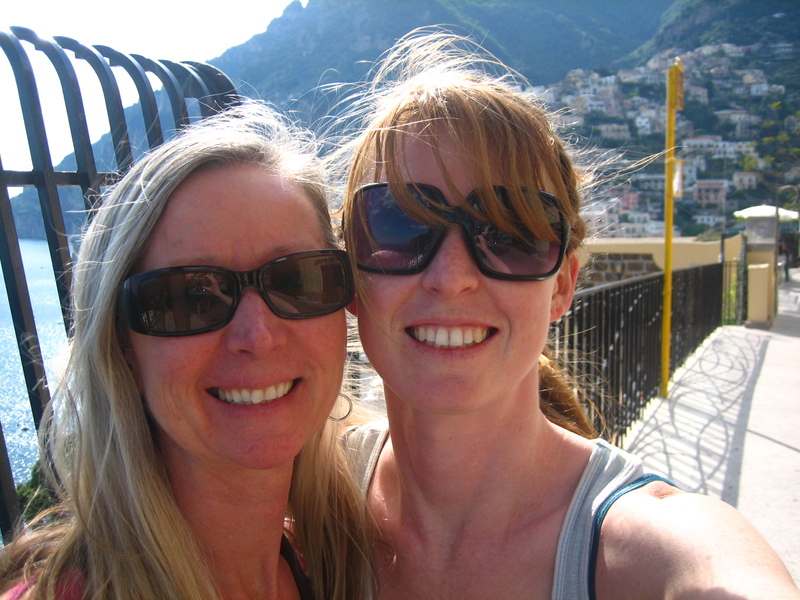 Just over a year ago we were in Italy together. Maybe next spring you can come visit me, too? After a glorious week in California, where we sat around and sweated in T-shirts and I truly worried about getting a sunburn, Colin and I are back in chilly DC. Our return trip felt much quicker than our trip going; it was painless but for a sudden case of motion sickness on the metro. We read one of Colin’s new books, World War Z, the whole trip home. And now, for the second night in a row, we’ve been plagued by zombie creepies as soon as it gets dark. It’s a fantastic book, though. Gripping. Set in the near future, it’s a collection of memories from the Zombie War that swept the globe. Colin suggested that the context could have been any catastrophe—aliens, widespread natural disasters, a regular plague—because the real strength of the book is how countries and individuals interact in the desperate situation. Cuba rises to power; North Korea goes underground; starving people take a cue from the Donner party. I highly recommend it. It’s been a marvelously lazy existence since getting back; Colin’s forgotten how to do this and I have to remind him that it’s OK that our productivity is rather limited, because that’s what the holidays and not being a working stiff are all about.